Costa Rica, a country prioritizing sustainability in Central America, looks to South Korea for greater cooperation based on shared values of peace and dialogue, multilateralism, sustainable development and human emancipation, its first lady Claudia Dobles Camargo told The Korea Herald in an exclusive interview. Dobles Camargo came to Korea last week to strengthen bilateral ties and celebrate the 197th anniversary of Costa Rican independence, which fell on Sept. 15. Her agenda focused on vitalizing cooperation in technology and innovation, green growth and carbon-neutral public transportation, particularly promoting the prospective construction of an electric train around the San Jose Greater Metropolitan Area. Born in 1980, the first lady is the wife of President Carlos Alvarado Quesada, who assumed office in May this year and will govern through 2022. She is a trained architect with 14 years of experience in large-scale international projects worldwide. 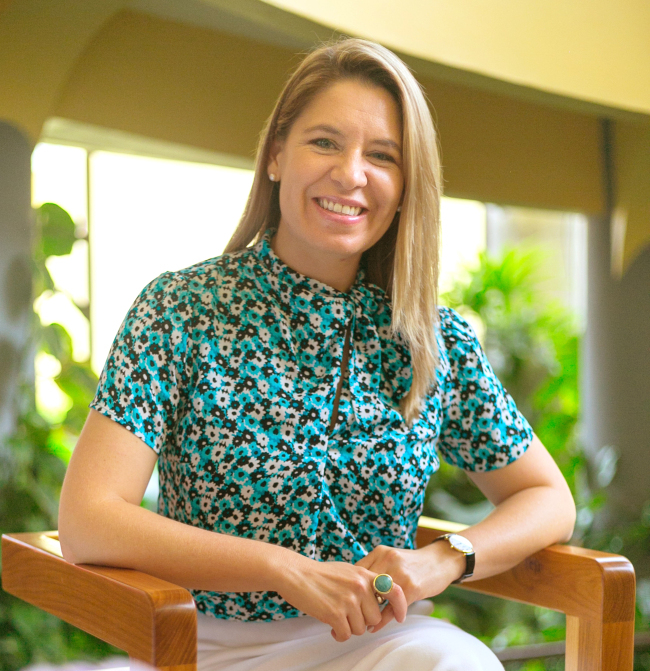 As first lady, Dobles Camargo said she strives to address housing, mobility and urban planning issues for her country, also leveraging international cooperation. “Cities must be planned for a sustainable future. Due to global warming and technological disruptions, it is our duty to change our vision of city-making to a more dynamic and participatory process,” she stressed. Noting she will speak at the Private Investment for Climate Conference organized by the Green Climate Fund in Incheon from Oct. 10-11, she pointed out that Costa Rica will launch a decarbonization plan toward the end of this year and diversify the nation’s sustainability criteria, which includes an assessment of the impact on infrastructure, technology, and water and waste management. Currently, a feasibility study is slated for completion next year, she noted, adding that international bidding is expected to take place by 2021 and construction will start in 2022. During her visit, Dobles Camargo met Korean first lady Kim Jung-sook, Minister of Land, Infrastructure and Transport Kim Hyun-mi and officials from the National Institute for International Studies, an agency that provides scholarships to foreign students. “Sustainability is the only way we can protect our next generations. The international community should work as a team and learn from each other,” she said, mentioning that nearly all of Costa Rica’s electricity is derived from renewables -- mostly hydropower, followed by solar, wind, geothermal and biomass. Costa Rica is well known worldwide for its progressive environmental policies. It is the only country to meet all five United Nations Development Program criteria for measuring environmental sustainability, and was twice ranked the best-performing country on the New Economics Foundation’s Happy Planet Index, which measures environmental sustainability. The nation of less than 5 million people plans to become carbon-neutral by 2021 with a clear road map and implementation plan that will wean its economy off fossil fuels. Dobles Camargo positioned Costa Rica as a highly stable country with a strong commitment to democracy. This year also marks the 70th anniversary of the abolition of Costa Rica’s army. Partly as a result of the historic decision, the nation has consistently scored well on the Human Development Index, placing 69th in the world in 2015 -- the highest rank for any Latin American nation. It has also been cited by the UNDP as having attained much higher levels of human development than other countries with similar income levels, with a better-than-average record on human development and inequality in the region. “We welcome investments from companies that share our values,” she explained, adding large potential exists for Korean and foreign firms to invest in Costa Rica and use it as a base for tapping into larger markets throughout Central and Latin America. Electric vehicles, environmentally friendly logistics and public transportation, smart city development, education, ecotourism, agriculture and renewable energy are some of the sectors awaiting foreign investment, she said. 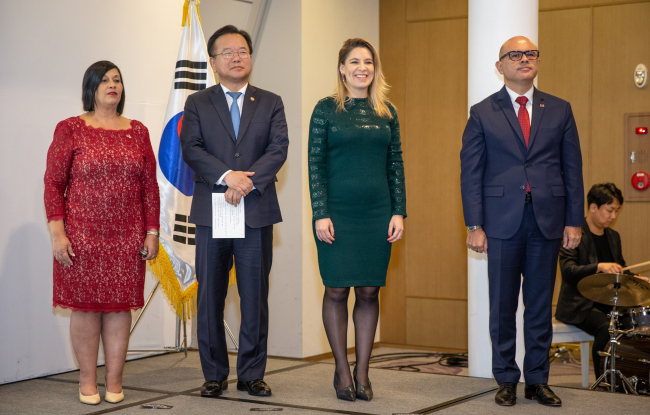 “We have a deep admiration for Korea’s technological development that has positioned your country as a global leader,” said Costa Rican Vice Foreign Minister Lorena Aguilar Revelo at a reception marking the country’s 197th independence anniversary on Oct. 8 in Seoul. Costa Rican Ambassador Rodolfo Solano Quiros said San Jose and Seoul had experienced 56 years of “fruitful encounters and knowledge transfers” through official diplomacy, eventually forming a Comprehensive Strategic Cooperation Partnership.